Five sites have been identified by Dublin City Council for the location of between 150 and 153 modular houses for homeless families. The sites, details of which will be presented to councillors at a meeting on Thursday, are in predominantly disadvantaged areas of the city with Ballymun, Finglas and Darndale, chosen on the northside and Crumlin and Ballyfermot selected on the southside of the city. The move follows the announcement earlier this month by Minister for the Environment Alan Kelly that 500 modular houses would be provided as emergency housing for homeless families across Dublin, 22 of which would be in place before Christmas. In the report to be presented to councillors, it has not been stipulated which of the five sites would be used for the first 22 factory-built homes. However the Ballymun site at Poppintree is the only one identified to accommodate 22 units. The council said these first units will be provided through an “ultra-accelerated procurement” process and so it is likely that just a single site will be chosen for this first tranche. 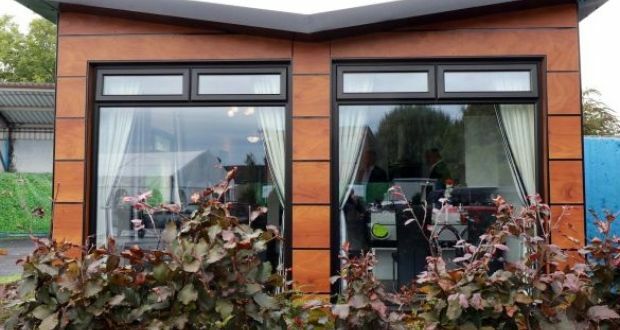 The council has already issued tender documents for the 22 prefabricated homes and is seeking a response from interested parties by November 2nd, with the units to be in place by December 21st. The remaining units, in the region of 130, are to be in place within the next four months, which will also require the use of a fast-track procurement process. The greatest number of homes would be accommodated in Finglas at a site on St Helena’s Drive, which the report says could accommodate 40 homes. A site at Belcamp Avenue in Darndale has the next greatest potential with room for 38 units. On the southside Mourne Road in Crumlin has been selected for 29 homes and Cherry Orchard in Ballyfermot could accommodate 24 modular homes. The report said the sites had been selected in line with motions passed by city councillors, and all five sites had already been selected for residential development in the city development plan. The next tranche of modular housing, some 350 units, would be provided through a new national procurement framework, which is being developed by the Government. Homeless households will be allocated the units on a licence as opposed to a tenancy arrangement and will pay an accommodation charge based on household income to the council. The modular units will be capable of long-term use, the council said, and it is intended that multiple emergency placements of families will occur until such time housing supply is such that these temporary emergency measures are no longer necessary and units can be put to other uses. Homeless people living in hotels! That is true here in the US as well. Dublin City Council is trying to the get ahead of the problem. These modular homes look inviting and livable. Remember the huge high rise apartment buildings of the past? Who would want to live so far away from the ground? I think that that should be taken into account when plans are being made. . . .the livability of the housing. That is most assuredly true wherever people are provided with new spaces, new areas, new technology. In order for the new homes to be safe and comfortable, people must be taught how to take care of their new places. The sad alternative is that if the homes are not taken care of to insure the proper upkeep, and they will become slums again. We saw this in India. . . . new homes that are a different life style. The people must be taught to keep them in good condition. 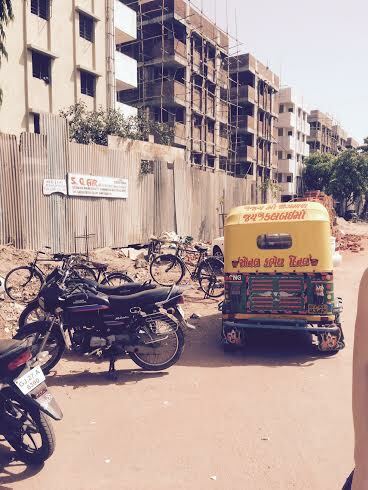 This is a block of new housing replacing the slums near our hostel in Amdavad. Five floors instead of ground level. Hmm. . . I hope it works for the new tenants and their families. Have you seen this happen when new housing is built to provide new safe housing for the homeless? What is done in your area for the homeless? This entry was posted in Architecture, Travel, Uncategorized and tagged architecture, Dublin Ireland, Homeless in hotel housing, modular homes, public housing, Quick and easy assembly of modular homes, suitability of the site of homes. Bookmark the permalink.